Contributed by | RS Components. As Earth Overshoot day passed by, we continue to battle with the constant reminder that the world's fossil fuel resources are only becoming more limited - and our global footprint significantly larger. 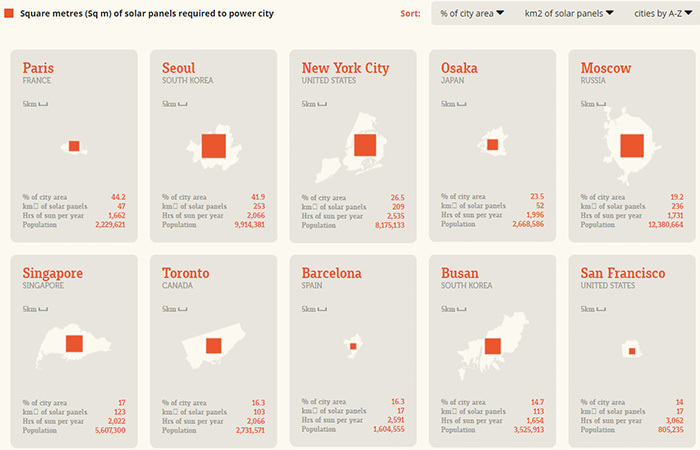 With the need for renewable energy amplifying, RS Components reveal just how little land is needed to power major cities across the world with solar energy with this interactive piece. According to the data, Paris is the most power-hungry city. Nearly half (44.2%) of Paris’ land space needs to be accommodated by solar panels to harness the sheer amount of energy needed to run the city. It may come as a surprise that London, England, places 8th in the same list requiring 138 km2 out of it’s 1,572 km2 area to power itself and its 8,787,892 strong population. Moscow, Russia and New York City, United States also take spots in the top 10, at 5th and 6th respectively. For more information on how many solar panels are needed to power the world, visit; RS Components.